Online payday loans are loans which are accessible online. Although it is possible to apply for most loans online today, the term online payday loans is preserved mostly for short-term loans like payday loans which involve small amounts ranging from £50 to £1000. Online loans can be applied, assessed, approved and disbursed online. They are very popular today because of their convenience. It is possible to get an online loan in the UK today within minutes. The loans are also popular because they lack traditional restrictions such as collateral. You don’t need security to secure an online loan. The loans are also available to all kinds of people including individuals with bad credit. Online loans are accessed through lender/provider websites. The loans hit the UK lending market more than 15 years ago. They have grown tremendously replacing most traditional short-term loans. Who regulates online loans in the UK? The FCA is in charge of governing all online loans in the UK. All UK citizens who borrow payday loans among other types of online loans are required to borrow from FCA-Authorised lenders only like SwiftMoney. Our FCA authorisation number is 738569. FCA authorisation is crucial because it shows that an online provider is legitimate and professional. Borrowers should look up potential lenders/providers on the FCA register which can be found here: https://register.fca.org.uk/. FCA regulation on loan such as payday loans, quick loans, etc. available online focuses on the promotion of such loans. In the recent past, online loan providers in the UK were guilty of issuing loans without providing full cost disclosure. On 1st April 2014, the FCA made major steps to govern how online loans are promoted, issued and repaid. These amendments were initiated in response to numerous complaints and fraudulent cases in the industry at the time. Today, lenders/providers are supposed to offer full disclosure including important information like the total fees. Lenders/providers are also barred from using misleading language which has a potential to confuse clients. The FCA has also set a limit on the total interest charges borrowers are supposed to pay to 0.8% daily. There is an overall cost cap of 100%. The maximum default fee has also been set at £15. Unlike the past, online payday loans are now designed with the best interests of borrowers at heart. There is a reason why online loans like payday loans have surpassed most types of short-term loans in the UK today. Here are the top payday loan benefits in comparison to other loans. 1. Convenience: The ability to apply and receive a loan without visiting lenders in person is one of the most favourable things about online cash loans. You just need a computer or a Smartphone and internet access to apply for a payday loan. To get most traditional loans such as personal loans, you must visit your bank and talk to a loan officer. Most people lead busy lifestyles today and don’t have the time to visit physical locations and queue. 2. No collateral or credit score requirements: You don’t need any security to secure an online loan. You don’t need a high credit score either. As long as you have a job/payslip or proof of income, you can get a payday loan from most payday loan providers in the UK. High street lenders require some form of security to issue loans. You need a good credit score to secure an affordable short term personal loan. 3. Speed: Online loan lenders like Swift Money can offer loans in 10 minutes. If you need cash for emergency expenses, payday loans from lenders like us are your best bet. Traditional loans take days to be approved and may even take more time to be disbursed. Most loans accessible online today are fully automated. 4. Easy to apply: Payday loans have very simple application processes because they don’t have a lot of requirement like traditional loans. Reputable lenders like SwiftMoney have very simple applications that are easy to read, understand and complete. 5. Affordable: As mentioned above, the FCA has capped the total fees/charges online loan borrowers are supposed to pay. This move has made payday loans, instant loans, fast loans, quick loans among other similar loans affordable. The FCA regulation has also introduced stiff competition in the past few years making online loans more affordable now more than ever before. 6. Secure: If you choose a reputable lender like SwiftMoney, you have guarantees on data security. Although the FCA has data protection guidelines, prudent payday loan providers like SwiftMoney have gone a step further to guarantee against data breaches which have seen some of the biggest payday loan lenders like Wonga suffer. To get an instant cash loan or a payday loan, you must fill in an online application providing your personal information such as; full names, address, bank account information, employer/income information, etc. After filling in a loan application form and submitting it, the next step is initial validation. This step is fully automated and meant to assess the accuracy of the information in the application. An initial validation involves processes such as checking the validity of telephone numbers, addresses, bank account information, postal code, etc. If your application doesn’t have any errors, it will proceed to step three. It’s important to note that you need to be a UK resident over 18 years to qualify for an online loan in the UK. You also need a job or proof of income as well as a UK bank account. Applications submitted to payday loan providers like SwiftMoney must be processed and matched with the best lenders. For this to be done, the information in the application must be prepared and adjusted accordingly to match the input fields and data required by underwriters and lenders. This step is usually automated. Once the information in an application is in a form that can be assessed easily by underwriters and lenders, it is sent to suitable lenders at once. SwiftMoney has access to over 20 reputable payday lenders in the UK. This entire posting process is automated. It takes a few minutes to match and application with an appropriate lender. If you filled your application correctly in the first step, you should expect to get a decision in a few minutes. Successful applications are accompanied by loan agreements. You may need to provide additional information at this point if you didn’t fill your application correctly. You should check your email regularly during this step since loan agreements are generated automatically. Once you read and agree to the terms of the loan, your application process is complete/approved. Once your lender receives your loan agreement, funds are processed for dispatch. SwiftMoney online loans are disbursed within 10 minutes after you accept the terms and conditions in the loan agreement. Funds are transferred to your bank instantly. Depending on your bank, it may take less or more time for you to receive the money. Please note: The online loan application process may involve manual underwriting processes. If you don’t fill in your application correctly, you may be required to make some clarifications which can prolong the process. To get your loan amount as soon as possible, it is advisable to fill your loan application form carefully and accurately. Payday loans among other short-term loans available online are payable during the next payday. The loans tend to have a 30-day limit although some lenders offer flexible repayment terms. The loan amount is usually deducted automatically from your bank account after your next payday. This can vary depending on the repayment conditions you accept. What should you consider when selecting a quick loan, fast loan, instant loan, payday loan lender or provider? 1. APR: The APR which is the annual percentage rate of a loan is an accurate indicator of the actual cost of short-term loans. An APR accounts for all possible fees/charges associated with that loan product. You should borrow from lenders with the lowest APR, i.e., lenders who will charge you the least interest/charges. 2. FCA-approval: To avoid unscrupulous lenders, it’s important to borrow from FCA-approved providers only since such providers are fully licensed and professional. 3. Approval rate: You should also consider the number of loan applications a provider processes successfully. Providers with a higher approval rate don’t reject loan applications easily. 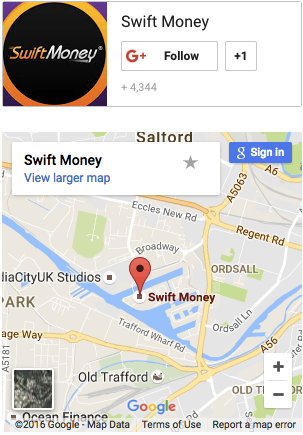 SwiftMoney has offered 400,000+ online loans since 2011. We have a 97% loan approval rate. 5. Online reviews: The lender or provider should also come highly recommended. You can review customer feedback online to see what other borrowers think of specific providers before you make your final decision. When reviewing different lenders, pay attention to verifiable reviews only. The internet is packed with fake reviews originating from multiple sources, i.e., from competitors. It’s also important to remember there is no perfect lender. You should consider online reviews objectively. Most loans available online today are small and short-term. Their nature makes them most suitable for handling emergency cash needs. You can use money acquired from a payday loan to pay for; unexpected medical bill, funeral expenses, car repairs, urgent home repairs, broken down appliances, etc. Short term loans should be used for their intended purpose. You shouldn’t take a payday loan to go for a holiday or buy jewellery. The loans are ideal for emergency expenses which can’t wait. Short-term loans should also be paid in time to avoid unnecessary charges. Payday loans should be taken and repaid within a month. They should also be taken sparingly, such as a few times a year, not monthly. You can take a payroll advance over a payday loan. However, payroll advances aren’t available to everyone. Some employers don’t offer this option. Furthermore, a payroll advance ties you to your current employer until you pay back the loan. For instance, you can’t change jobs before you settle your payroll advance. It can also set a bad precedent if you make it a habit. In some professions such as finance, you are expected to have unmatched personal finance habits. Taking an advance repeatedly in such a case may impact negatively on your career progression. Reputable lenders have adequate dispute resolution mechanisms. If you face any problems applying or repaying your loan, follow the appropriate complaints policy/procedure. Complaints can range from declined applications and delayed loan disbursement to unfair fees/charges. A good provider should be able to deal with borrower complaints to satisfaction. Licensed credit brokers in the UK are governed by the FOS (Financial Ombudsman Services) when handling customer complaints. A responsible provider should do whatever it takes to resolve the complaint as soon as possible. If the complaint is solved, well and good. If not, the provider must inform the client within five days. An investigation must be launched immediately, and a final written response sent to the borrower and copied to the FOS. If you aren't content with the outcome or response, you have a right to engage the FOS directly within six months. For more information on our online loans, call 0800 567 7444 or email us: Support@SwiftMoney.com. You can also reach on our social media pages.